Market3 is proud to announce the launch of the newly redesigned, efficient and user-friendly WordPress website for Delaware Valley Safety Council. DVSC has been a long-time client for Market3. In fact, this is our 4th website design we’ve done for them. The Delaware Valley Safety Council provides world-class safety training to contractors and employees working in industrial facilities throughout Delaware, New Jersey and Pennsylvania. Using state-of-the-art technology, they provide best-in-class training programs for industrial environments. 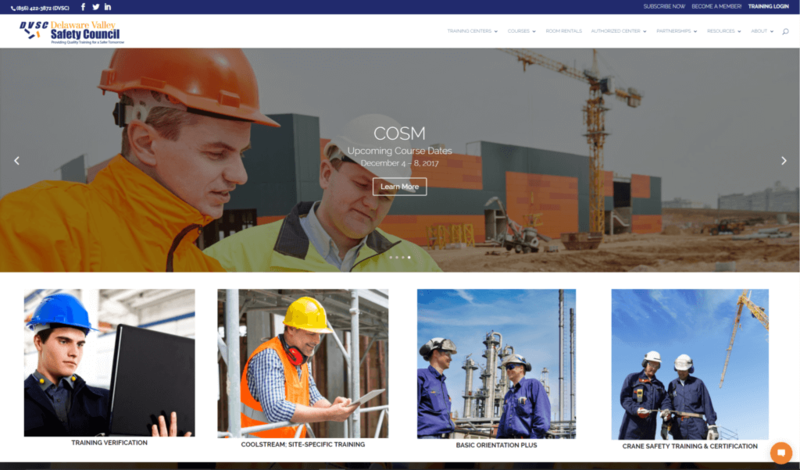 With a mission to have every industrial worker return home safe at the end of the day, they need an up-to-date website. The need to redesign DVSC website for the 4th time came from the call for a better user experience for current and potential members. The Council’s new website was built and fully customized on a WordPress platform. As a New Jersey web design firm, Market3 understands the importance of having an interactive social media presence on a website which is why we linked the Council’s platforms throughout the site. Another important feature to DVSC’s new website is their integrated online training center login portal. This makes the overall user experience easier for all members. There is also the ability to reserve and pay for room rentals, their newest offering. Members can view and read about a room, prior to booking it online. A video library on the website gives members quick access to some training video material. Our New Jersey web design team knows what clients want is the ability to manage their website on their own. That is why we build websites on WordPress. WordPress uses CMS, or Content Managed System, that allows DVSC to have full updating capabilities. This includes uploading new content, videos, and photos, to ensure the website visitors have the most current information.